This entry was posted on July 6, 2012 by Sports Traveler. I Hope everyone managed to stay cool this week as temps soared over 100 degrees in many parts of the country. The beginning of July unfortunately brings in scorching temperatures but we also inch just a little bit closer to the amazing spectacle known as the NFL season. In just 2 short months the 2012-13 NFL campaign kicks off for the first time. 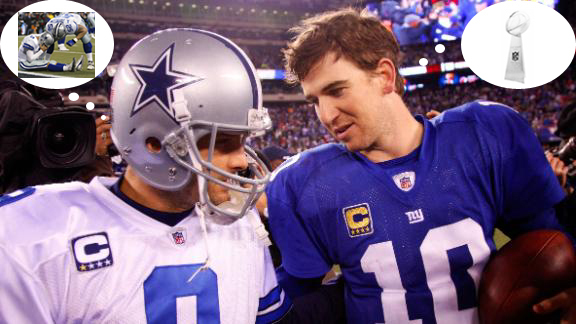 The season begins with a bang this year as the Dallas Cowboys take on the New York Giants in East Rutherford, NJ. This strangely placed Wednesday night game will be the first regular season affair for any NFL team and it is the only game scheduled for opening night. For the Cowboys, this game couldn't come any sooner. In the final game of the 2011-12 regular season the Cowboys were in control of their own destiny and simply needed to beat the Giants to move on to post-season play. The Cowboys failed to score any first half points and went on to lose 31-14. The win for the Giants put them in the playoffs while Dallas got to sit back and watch their division rival climb to the top of Mt. NFL and hoist the Vince Lombardi trophy for the second time in 5 years. This of course is painstaking for the Cowboys, their fans, and a certain owner who doesn't take too well to losing. The truth is the Cowboys have been underachieving since Tony Romo became the everyday starter. There are many different factors that play into why the Cowboys have not lived up to expectations but at the end of the day those factors are only excuses. Sure the Cowboys probably enter every season with unreasonable expectations. Much like the Yankees or the Lakers. When you are "America's Team", Jerry Jones is your owner, you have the world's most famous cheerleaders, and your home field is a world wonder then perhaps these expectations are self inflicted. Either way the sun has set on the disappointment of the last few seasons and in September they begin a new mission with the same goal. Super Bowl. The Cowboys are faced with a tough schedule this year both at home and on the road. The 2012 Cowboys schedule also features a couple of big match-ups that we don't get to see every year. The first game that catches my eye is the Monday Night game against the Bears. The Bears look to be a very strong team in 2012 and the Cowboys are seeking some payback after the Bears beat the Cowboys in their brand new stadium back in 2010. The other two huge non-divisional home games for the Cowboys are against the recently shaken but still powerful New Orleans Saints and the Pittsburgh Steelers. There isn't much to the Saints-Cowboys rivalry but these teams have been putting talented rosters on the field for a few years now and the Cowboys delivered the first loss of the season to the Saints in 2010 after New Orleans started the season 12-0. However, the Steelers and the Cowboys have Super Bowl history that NFL fans during the 70's will never forget. Nothing like rekindling an old AFC/NFC rivalry. The two big non-divisional road games this year will be at Baltimore and Atlanta. You can make a case for the Bengals game being tough but I don't take Cincinnati's playoff berth last year too seriously. Any game in the NFL is important but these are certainly key games for a Dallas team that will need to get quality wins on the road this upcoming season. However, this team has to get over the mental hump. Being a member of the most popular NFL team comes with a lot of pressure and some just aren't cut out for it. Pressure can push people to that breaking point and disappointment can send those players over the edge. I think there have been several talented Cowboys' players in that boat who never could put the pieces together. In 2012 there is a fluid combination of new and old faces. And through all the new and old there is one constant.... that blue star on the side of the helmet. Historically it stands for legacy, triumph, and excellence. Recently it stands for turmoil, doubt, and disappointment. 2012 looks to be the year the Cowboys put that talent to proper use. Look for the Cowboys to really become comfortable with head coach Jason Garrett and defensive coordinator Rob Ryan. I won't say that this team makes the Super Bowl because its just too hard to make that statement. They play in one of, if not the most difficult division in football and its always hard to come right out and label a team "Super Bowl bound" in July. What I will say is that Romo will have MVP numbers, Ware will be in position to lead the league in sacks, the defense will be much better, and the Giants cannot do what they did last year and find the same success. The other side of that divisional coin is the Eagles who, like the Cowboys, underachieved in 2011. The Eagles have as much talent as any team in the NFL and the heat is on in Philadelphia for coach Andy Reid. The Eagles turned it on at the end of last season and I do think they will carry that momentum into 2012. In the end I think this division is a lock for 2 playoff spots and I don't think its unreasonable to think that 3 teams could make it from the NFC East. With that being said, I believe the Cowboys will be the class of the division in 2012. OFFICIAL ANNOUNCEMENT: Cowboys step up to the challenge this year. Despite having a difficult schedule I believe the boys from Dallas end up at 12-4 as NFC East champs and a first round bye. The tough schedule will have the Cowboys fully prepared for a strong playoff run. The Cowboys might fly under the radar this year with all the interesting story lines in the NFL but that might be just what they need.